The Pantera is DeTomaso's most significant production car to date, and lived an overall production life of nearly 25 years. It is the model which most people identify with DeTomaso, and completed the company's transition to a volume producer of high performance GTs. In describing the Pantera's career, especially from a U.S. perspective, it is easiest to view it in three separate stages: the Ford importation era (1971 - 1974), the post-Ford era (1975-1990) and the final iteration (1991-1994), as these last Panteras were substantially different than all prior machines. In the late 1960s, Ford was in need of a high performance GT to combat the likes of Ferrari and Corvette, and assist in generating additional dealership traffic for its mainstream product lines. DeTomaso Automobili was relying on Ford for engines used in the Mangusta and had purchased the Ghia design and coach-building concern. After Ford's failed attempt to purchase Ferrari, the Ford-DeTomaso marriage seemed quite natural, so a business / purchase arrangement was consummated and work began on a new mid-engined GT. It would be marketed in the U.S. by Ford's Lincoln-Mercury division. Ghia stylist Tom Tjaarda styled the new machine, and Giam Paolo Dallara was engaged for chassis and production design. 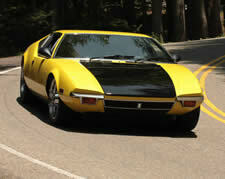 The Pantera's layout differed from the Mangusta in several fashions. First, it was conceived with a full monocoque chassis layout, as opposed to the prior car's spine chassis design. Secondly, it to be built around Ford's then-new 5.7 liter (351 cu. in.) "Cleveland" V-8. This engine featured deep-breathing heads patterned after the very successful Boss 302 design, 4-barrel carburetor and 4-bolt main bearing caps. The new V-8 was mated to a ZF fully synchronized 5-speed transaxle with limited slip, and rated at 330 horsepower (SAE Gross, 1971 trim). All of the expected race-inspired componentry is present: fully independent suspension with upper and lower A-Arms, coil-over shock absorbers, front and rear sway bars, 4-wheel power disc brakes, cast magnesium wheels by Campagnolo and rack-and-pinion steering. The front compartment houses the brake booster, master cylinder, battery and tool kit; the rear trunk unit, easily removable for engine access, holds a considerable amount of luggage. The interior features an aggressive cockpit design, full instrumentation, factory air conditioning and power windows. 1971 and 1972 cars carried chrome bumperettes front and rear. In late 1972, the "L" model was introduced, which features black safety bumpers front and rear, improved cooling and air conditioning systems and other enhancements. For 1973, the "L" model continued with a revised dashboard and instrument layout. The last Panteras constructed for the US market were built in late 1974, and included approximately 150 GTS models. The GTS featured fender flares and additional black out paint trim. European versions received larger wheels, tires and other performance minded enhancements. The first Panteras were marketed at "Around $10,000" as the advertisements would say; the final 1974 units carrying prices of approximately $12,600. At the end of the 1974 model year, Ford and DeTomaso Automobili dissolved their business arrangement, and importation of the Pantera to the United States was concluded. Mr. DeTomaso reassumed ownership of the Pantera project, and production was continued on a more exclusive basis for markets other than the US. Several models ensued, including the GT/4, which was modeled after the successful Group 4 competition cars of 1972-3. It wore larger fender flares, 10x15 and 13x15 inch racing wheels and aggressive Pirelli P7 tires. A GTS and Group 3 performance version were also offered along with the now-standard L model, and Pantera buyers could custom-fit the car with their choice of optional colors and features. The GT5 model was introduced in 1980, and it featured much-revised "ground effects" bodywork, including a deep front air dam with integral driving lights, rocker panel extensions, flared wheel arches and a deck lid-mounted "delta" wing spoiler. The GT5 was augmented in 1985 with the introduction of the GT5-S. The GT5-S represented the first significant body redesign of the Pantera since its introduction, which included new, wider flared front and rear fenders, side air intake grilles and a further revised front fascia. The interior also received substantial upgrading including revised air conditioning and console layout, "gathered" leather upholstery on the seats and door panels, upgraded carpeting, and burlwood paneling on the doors, dashboard and console. In 1989, DeTomaso engaged the talents of Italian automotive designer Marcello Gandini to freshen and update the Pantera's appearance for the Nineties. This redesign also encompassed substantial revisions to its chassis layout and mechanical specification. All of the lower body cladding was new, as were the rear airfoil wing and the unique spoiler at the base of the windshield. The latest 17" cast alloy wheels and Michelin Z-rated tires were specified, as were large, ventilated Brembo disc brakes. This new look significantly modernized the appearance of the Pantera, but a considerable amount of updating also lay beneath the skin. Whereas the prior car was of a monocoque chassis layout, this new and final version of the Pantera employed a largely tube frame structure. The goals were lighter weight and increased chassis rigidity. Both goals were met according to the factory. An all-new suspension was also part of the package. Most of the new cars still employed the ZF 5-speed transaxle, but two of them were fitted with a Getrag 6-speed unit. The 1991 cars also marked a major change in the engine compartment. While all previous Panteras carried the aforementioned 351 Cleveland (and some 351 Windsor) engines, the new model switched to a modified 5.0 liter (302 cu. in) Ford V-8, a unit that traced its roots back to the same engine used in the Mangusta. Rated at 305 horsepower, the new unit employed computer-controlled direct port fuel injection and the latest electronic engine management systems. ANSA developed a fully catalyzed exhaust system for cleaner exhaust emissions, yet the car maintained the deep-toned exhaust note associated with a Pantera. The interior was largely unchanged from the package developed for the GT5-S, though again it used the highest-quality woods and leathers. Out of a total of 41of these final-edition Panteras constructed, four were converted, while still under construction, to a "targa" model featuring a removable top section. The work was performed by Pavesi of Milan. The last Panteras were built in 1993, bringing to a close nearly 25 years of continuous production. 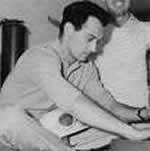 Alejandro de Tomaso was born in Buenos Aires on 10 July 1928 to a land-owning family of Italian origin. The Peron régime forced him to leave his native Argentina; young Alejandro escaped to Italy with the desire to become a racing driver. He succeeded, returning to Argentina in 1956 to race a Maserati 150S with Carlos Tomasi in the 1000 km of Buenos Aires. They won their class and finished 5th overall. In 7th place was the Maserati of Carlos Lostalo and Isabelle Haskell, a blonde American from Red Bank, New Jersey. In January 1957, Haskell and de Tomaso shared a 1.5-litre OSCA built by the Maserati brothers in the Buenos Aires race; they finished 6th overall and got married in West Palm Beach, Florida in March the same year. Their partnership continued on the track coming first in class, first in Index of Performance and 8th overall in the 1958 Sebring 12 Hours with a 750cc OSCA. De Tomaso’s racing career continued with an 11th place overall at the 1958 Le Mans 24 Hours, driving with Englishman Colin Davis, and finally ended with an 18th overall finish in partnership with Ricardo Rodriguez at the Sebring 12 Hours in 1960. The de Tomaso family started building their own racing cars from October 1959. Adding mid-engined road cars from 1963, they establishing close links with coachbuilder Ghia and the Ford Motor Company. 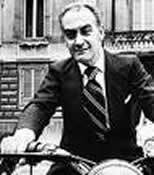 Around 1967/68 Alejandro de Tomaso, with backing from Henry Ford II, negotiated with the Orsi family to sell their shares in Maserati to the Ford Motor Company. However, Adolfo and Omer Orsi, along with technical director Giulio Alfieri, opted for a merger with Citroën instead. Ford in turn bought De Tomaso Automobili, the Ghia studio and coachbuilder Vignale. Alejandro de Tomaso finally got hold of Maserati in 1975 after Citroën's new master Peugeot closed down the Modena factory. The mayor of Modena asked de Tomaso to talk to Gianni Agnelli to save Maserati, but Fiat – which also owned Lancia and Ferrari - was also navigating in troubled waters around the same time. With financial backing from the government agency, GEPI, de Tomaso took control of Officine Alfieri Maserati from November 1975. He integrated production with Innocenti, a small Milan-based car manufacturer, and motor bike makers Moto Guzzi and Benelli. His second-in-charge, Aurelio Bertocchi, was the son of legendary Maserati chief mechanic and test driver Guerrino Bertocchi. The first Maserati conceived under de Tomaso’s management - the Kyalami, a restyled and re-engineered De Tomaso Longchamp - was launched at the Geneva motor show in March 1976, just five months after the takeover. The Italdesign-styled Maserati Quattroporte luxury saloon re-established Maserati in the market around 1980, selling in larger numbers (2,141) than any of Maserati's previous GT cars. Maserati returned to the 2-litre class, where its road car production had started 35 years earlier, from December 1981 with the Biturbo. The move was dictated by late ‘70s Italian market conditions, as well as by the Italian government which was a major shareholder of both Maserati and Innocenti through the GEPI agency, then headed by Romano Prodi. Highly controversial in its day, the Biturbo range introduced traditional Italian GT car values and performance to a far larger clientele, topping with annual production figures in the region of 5,398 to 6,356 cars between 1983 and '85. 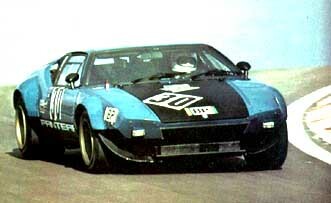 Although there was no official championship for GT cars (Group 4) 1972 was an interesting year in GT racing. Indeed the new 5.8 De Tomaso Pantera GT4 with its 440bhp at 7,000rpm Bud Moore prepared Ford Boss 351 5,763cc motor (470bhp for the Le Mans cars) was a real challenger for the Corvettes, Daytona Ferraris and Porsches 911. Especially Porsche was unhappy with the new car of Alessandro de Tomaso from Modena. They insisted upon the FIA to refuse the homologation of the 1,100 kg version, enforcing De Tomaso to deliver a 1,250 kg race version of the standard 330bhp Group 3 street car. At five rounds the GT4 Panteras were real works entries, whilst the opponents were restricted to private entries. 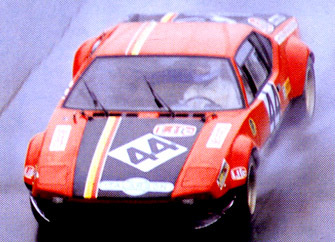 It seems forgotten that GT4 Panteras won more than half the World Manufacturers Championship races they contested in 1972. This was the only year there was any real presence from the De Tomaso factory which generally ran works-owned (but not openly sponsored) entries for Roberto Businello's Escuderia Montjuich and Herbie Muller. Factory supported GT4s were also run under the Scuderia Citta del Mille and Brescia Corse banners, the CdM entry stealing the show on the GT4s WMC debut: the 1972 Monza's 1000-km race, being finished as 5th overall. The following round in Spa was again won in Group 4 by the Pantera GT4, now Claude Dubois's, finishing 7th. At the Le Mans March Trials Herbert Müller clocked 4'16"3 with the Escuderia Montjuich car, fifth best time overall. At the eventual 24 hour race, only one of the four Panteras could be brought home, the Belgian one, using a standard 330bhp Group 3 engine after the 470bhp works engine was blown up during practice. Zeltweg was again won by a Pantera GT4, bringing its total up to three wins. Direct opponents were the 7.0 Chevrolet Corvette ZL1 of David Heinz, the 7.4 Chevrolet Corvettes L88 of John Greenwood 500bhp for 1,250 kg), the 4.4 Ferraris 365GTB-4 (352bhp to 400bhp) of N.A.R.T. and the Michael Keyser 2.5 Porsche 911S (225bhp for 980kg). All those cars were regular entrants at the SCCA series. They were not only seen at the three American rounds of the WMC, but also at Le Mans. At the European rounds the fastest Group 4 car was Erwin Kremer's 2.5 Porsche 911S. At the Le Mans 24 hours no less than nine Ferraris 365GTB-4 were entered: three by N.A.R.T., two by the Scuderia Filipinetti, two by Charles Pozzi, one by Maranello Concessionaires, and one by the Écurie Francorchamps. By collecting ranks 5-6-7-8-9 they took the five first places in Group 4. Of the nine rounds of the WMC where Group 4 cars were allowed, the Corvette ZL1 won twice (Daytona, Sebring), the Ferrari 365GTB-4 twice (Le Mans, Watkins Glen), the Pantera GT4 three times (Monza, Spa, Zeltweg) the 2.5 Porsche 911S twice (Targa Florio, Nürburgring). Although no longer entered as a works car, the Pantera de Tomaso GTS is the only car which is able to beat the 2.8 Porsche Carrera RSR at two rounds of the European Grand Touring Championship. At Imola victory goes to Mike Parkes, responsible for the development. At Hockenheim Clay Regazzoni wins with the Team VDS Pantera. At the WCM Team Franco-Brittanic, using Guy Chasseuil and Jean Vinatier as drivers, will enter a Pantera at the Dijon 1,000-kms. And at the Monza 1,000-kms MoMo Racing Team will start a Pantera with Giampiero Moretti and Giancarlo Manfredini as drivers. At the EGTC the Jolly Club Pantera will finish third at the Monza 6 hours, and at the Tour de France (also an EGTC round) a private car will finish sixth. The Pantera GTS uses a 90° - V8, 5,763cc Ford motor, developing 485bhp for 1,120 kgs.